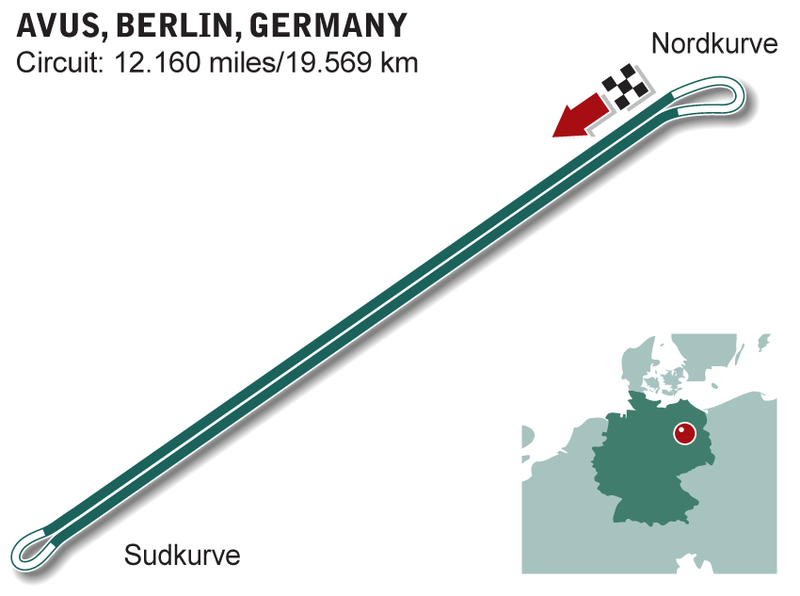 The AVUS (it's an acronym for the rather less snappy "Automobil Verkehrs und Ubungs Strasse") circuit near Berlin was originally designed as a motor-race circuit and a testing track for cars. It was basically two long (about five miles) straights, joined by a hairpin turn at each end. It was started in 1907, but not finished until 1921. One of the hairpins was later replaced by a steeply banked curve, which became known as the "wall of death" as there was nothing resembling a retaining wall at the top to prevent out-of-control cars flying off into mid-air. This happened to, among others, the French driver Jean Behra, who was killed in a sports-car race during the 1959 meeting that also included the only championship German GP to be held at AVUS: Tony Brooks won it in a Ferrari. By that time the circuit had been reduced in length as some of the original track was now in Soviet-controlled East Germany. The banking was removed in 1967, but fewer and fewer races were held at the circuit, the last of any sort being in 1998. Part of the track has now been absorbed into the German Autobahn system (No. 115).